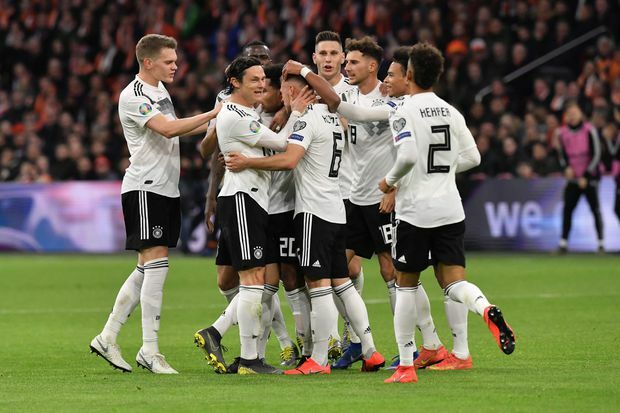 Germany's players celebrate after scoring during the UEFA Euro 2020 Group C qualification football match between The Netherlands and Germany at the Johan Cruyff Arena in Amsterdam on March 24, 2019. After a year of problems off the field – and humiliation on it – the new Germany is finally starting to look like the old Germany. Grit, determination and Nico Schulz’s 90th-minute winner earned the Germans a confidence-boosting 3-2 win over the Netherlands on Sunday in a European Championship qualifier. Croatia looked a shadow of the resilient team which reached the World Cup final in July as it lost 2-1 to Hungary in Budapest. Spells of confusion in the Croatian defence are likely to concern coach Zlatko Dalic in a group where four teams look like contenders for two qualifying spots for Euro 2020. The Dutch beat Germany 3-0 in Amsterdam in October and earned a last-gasp draw in the return fixture. Those results helped to relegate Germany from the top tier of the Nations League – further embarrassment after its disastrous 2018 World Cup campaign when it failed to advance from the group stage. The challenge now for Loew is to keep the momentum going – after all, the win over Sweden was seen at the time as a much-needed boost after a poor run. It proved a false dawn when Germany promptly lost to South Korea and spectacularly crashed out of the World Cup. A 6-0 loss to Spain in the Nations League, a 3-2 win over Spain soon after and Thursday’s laboured 2-1 win over Azerbaijan have highlighted Croatia’s moments of brilliance and its vulnerabilities after losing key players to international retirement and injury.